Does the Growth of Bitcoin Have Anything to Do with Distrust of Government? 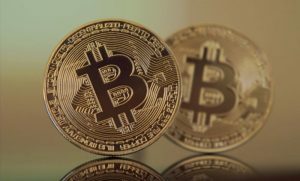 The results of the latest Financial Trust Index (FTI) survey, released last week by Chicago Booth and the Northwestern’s Kellogg School of Management, offer some provocative, even if only preliminary, insights into the motivations of Bitcoin holders. We analyzed data from the seasonal supplement in Wave 26 of the FTI and found that, while approximately 63.7 percent of the general population has heard of Bitcoin, just 61 out of the 1,007 survey respondents (6 percent) said they own or will buy Bitcoin within the next six months. More than three-quarters of self-reported Bitcoin users were male. Eighty-nine percent of those who plan to purchase Bitcoin within 6 months said they are doing so for solely investment purposes (as opposed to using Bitcoin for transactions). Given how small the cohort of Bitcoin users is in this year’s FTI dataset, a simple difference in means test cannot verify this impact for the general population. 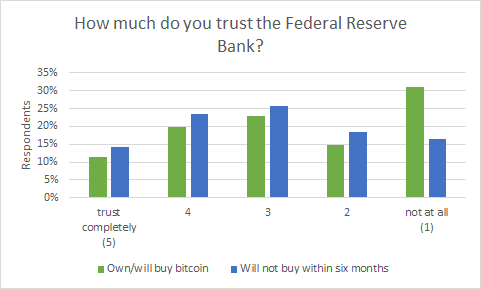 However, this result—that among respondents to this survey Bitcoin users are around twice as likely as non Bitcoin users to say they do not trust the Federal Reserve at all—offers some preliminary evidence in support of the view that anti-government feeling is driving some Americans, most of them men, into the arms of cryptocurrencies. For many mainstream economists, Bitcoin’s potential to subvert political power is precisely why it requires an urgent regulatory response. “Bitcoin is successful only because of its potential for circumvention, lack of oversight,” Nobel prizewinner Joseph Stiglitz recently said in an interview in which he called for Bitcoin to be banned. For some Bitcoin supporters—among them venture capitalist Pascal Bouvier, who recently examined the complications of the cryptocurrency craze in a ProMarket post—this subversive potential is a feature, not a bug. What is unclear is to whom cryptocurrencies are actually transferring power (one recent study, for instance, found that in fact the Bitcoin network is itself highly centralized and technocratically governed). It falls to future researchers to confirm whether the glimmers of a correlation in the FTI dataset between Bitcoin use and distrust in government institutions are borne out in larger-N studies.